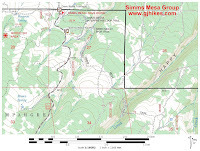 The Simms Mesa trail is located in the Plateau Division of the Uncompahgre National Forest near Montrose, Colorado. The trail begins off of the Dave Wood Road, FR #510, where it travels across the mesa before crossing a couple branches of the Happy Creek drainage. After continuing on across the mesa just past the 1.5 mile point it drops into Happy Canyon. After a short climb back out the other side of Happy Canyon the trail comes to an end once it reaches Forest Road #574. To get to the trailhead follow the Dave Wood Road for 15 miles from Montrose. The trailhead is near a corral on the left side of the road just over a quarter mile from the Forest boundary. After passing through the gate follow the trail to the right. One of the first trail markers comes up a short distance from the trailhead. Just past the quarter mile point the trail reaches the edge of the mesa and is met on the left by a spur of the Simms Mesa Loop trail. From there the trail turns to the right and begins a short gradual descent into a draw. In the bottom of the draw a junction comes up where the Simms Mesa Spur , aka Aspen Grove, trail connects on the left. From there the trail climbs over the hill and into another draw where there is a junction with the other end of the Aspen Grove trail. The Aspen Grove trail makes a loop that is about 0.6 miles long that goes down one draw and back up the other. Once the trail gets to its second junction with the Aspen Grove trail it heads up the drainage for just over a quarter mile and then begins climbing back up to the mesa. The trail gets real easy as it continues across the mesa. 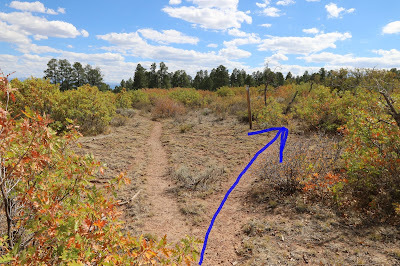 There is a fork that comes up where the left branch looks like the better worn route but the trail marker is on the right fork indicating that it is the designated route. At the 1.5 mile point the trail crosses an old jeep or logging road. Just across the road there is a trail marker but someone has put a pile of branches across the trail which usually indicates a closed trail or a wrong route. 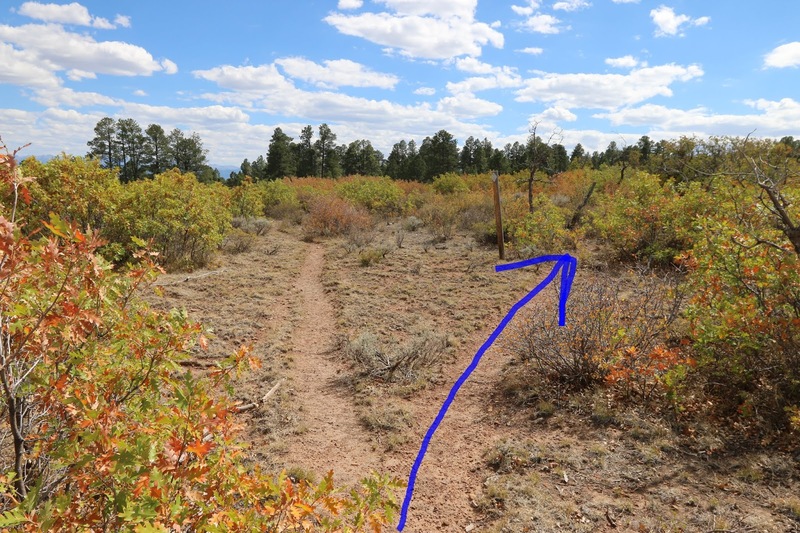 If you go around the branches you will continue to find trail markers but after crossing another jeep road or skid trail things start becoming even more confusing. Instead of an easy to follow trail at that point there starts to be a lot of downed trees to step over and the route pretty much disappears. We did what we normally do when a trail disappears and began making a big loop around the area trying to find it once more. After retracing our steps and checking out both of the jeep roads we ended up back at the same spot where the trail was covered with down trees and disappeared. Continuing toward the rim of Happy Canyon from that point the trail reappeared at the edge of the canyon along with a few more trail markers. From the rim the trail ends up angling steeply down into the canyon and out the opposite side. The lower part of the trail isn't well marked until you get to the point where it climbs out and there is another post. 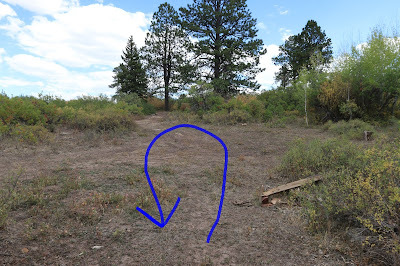 Once the trail gets back out of Happy Canyon it comes to a road where there is a trailhead sign laying on the ground. This spot is about a quarter mile from Forest Road #574 but since this road didn't show up on our map and it was unclear which way to follow it we decided it would be a good place to turn around. Most people will probably want to turn around at the 1.5 mile point unless if for some reason they really want to cross Happy Canyon. The Simms Mesa trail is open to mountain biking but it probably wouldn't be much fun doing the part that goes in and out of Happy Canyon because it would all become a hike-a-bike at that point. 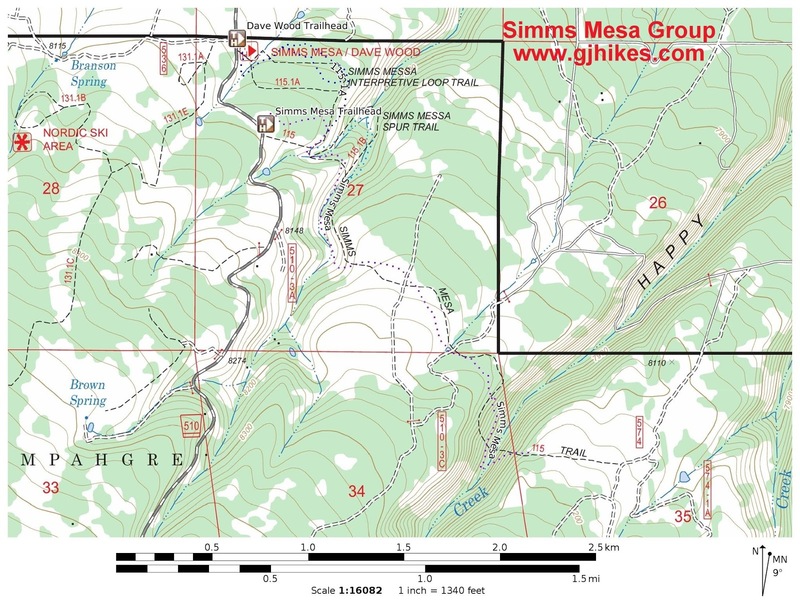 Other than the difficult route finding near Happy Canyon the Simms Mesa trail is a nice hike in an area that is close to town and relatively fun to explore. If you would like to see it for yourself then all you have to do is 'Take a hike'.